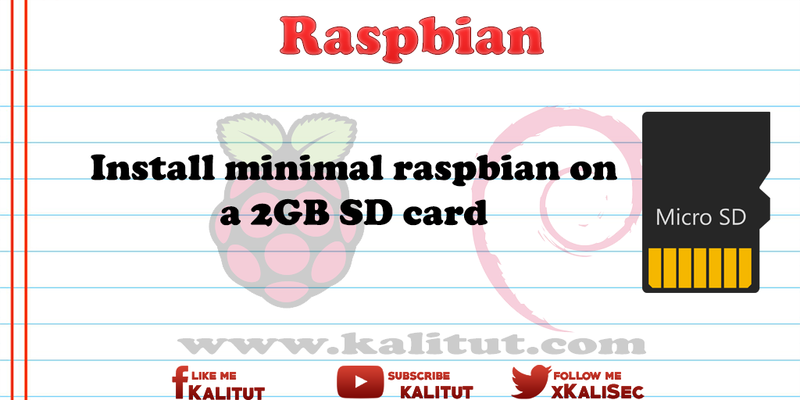 Install minimal raspbian on a 2GB SD card Only a 2 GB SD memory card is available for this task. Download a suitable operating system image for the Raspberry Pi. Play this image on the SD memory card. Put a Raspberry Pi into operation. Although SD card is not too expensive. But who still has a few old SD memory cards in the drawer, who wants to continue to use. That's not a problem at all. It's just a question of where to get an image of the right size. Raspbian, one of the most popular distributions for Raspberry Pi, is just under 4 GB in size, which is why it fits on a 4 GB SD memory card. But that can change fast because in general, all distributions get bigger with time. In addition, one would like to install some software. Therefore, it can not hurt to look for alternatives that need less storage space. Only a 2 GB SD memory card is available for this task. Download a suitable operating system image for Raspberry Pi. Play this image on the SD memory card. Put a Raspberry Pi into operation. Therefore, in the first step, you should determine the size of the SD memory card. The storage capacity is printed, so you do not have to read somewhere. With this knowledge, you can therefore go in search of a suitable image. It is also necessary to clarify what the username and password for the alternative images are. Often the user is "root" and the password is "raspberry". Lite variant of Raspbian Jessie. Fits even on a 1 GB SD card. If you want to stick to the Raspbian operating system, a minimal image would be a good solution. This fits theoretically with a 1 GB SD card. For a 2 GB SD memory card, the image is better, because then there is still space for reinstalling software. Minibian even comes out with only 522 MB. A bit too much for a 512 MB SD card. But for a 1 GB SD card a good solution, because there is still enough space to reinstall software. If you still have very old SD cards, maybe only 32, 64 or 128 MByte, you should take a look at Tiny Core Linux . It is generally advisable to use "no" alternative image for all instructions and tutorials, but a standard distribution, such as Raspbian. Experience has shown that making life unnecessarily difficult when using stripped-down or special distributions. Drivers for USB devices that are standard on Raspbian are often missing here. Rasbian is the classic among the Linux distributions for Raspberry Pi. Rasbian is based on Debian, which attaches great importance to stable and secure operation. Unfortunately, Raspbian brings so many packages that you do not really need. In particular, if you can do without the graphical window interface, then it may be worthwhile to create a minimal Raspbian yourself. This saves a lot of storage space on the SD memory card. So much that the image fit afterwards on a 2 GB SD card.